Insurance disputes often arise after a loss or injury occurs and an insurance company denies coverage. These situations are particularly stressful because people are oftentimes faced with significant financial hardship if they are left paying for the loss themselves. 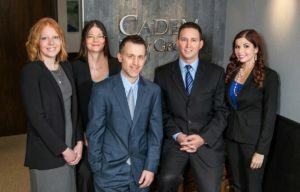 Attorney Christopher Cadem is an experienced insurance insider. Having been a licensed property/casualty insurance agent for 7 years, and the former vice president of a St. Paul based insurance agency, he is familiar with insurance company protocol and methods, as well as a growing number of adjusters working at some of the biggest insurance companies represented in Minnesota. He has also successfully sued insurance companies to obtain coverage for his clients when negotiations have failed. If you are faced with an insurance dispute, experience and dedication matter. Contact our office online or call 218-739-HELP (4357) to schedule a free consultation to discuss your options. Key Practice Topics: Insurance; Dispute; Deny Coverage; Tender of Defense; Reservation of Rights; Notice of Declination; Declaration Page; Insurance Agent; Insurance Company; Adjuster; Premiums; Deductible; Exclusions; HO; Perils; Exclusions; Definitions; Restrictions; Deductible; Policy Term; Fraud; Omitted Information; Per Occurrence; Post Date; Back Date; Gap Coverage; Commercial; Defendant; Plaintiff.